This soup is one I “rebuilt” from Olive Garden that is undoubtedly the most popular soup on their menu. 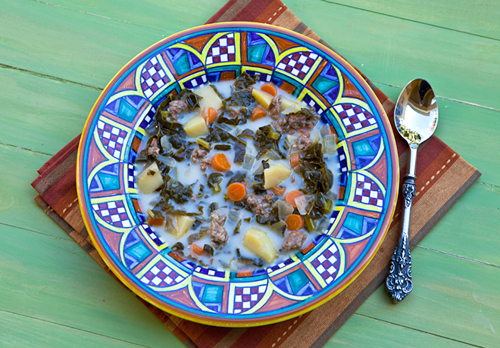 The soup contains chunks of potatoes, kale, sausages, and onions all in a creamy broth. The original soup has sliced pork sausages in it and I always found the slices a little large for my liking so I replaced the slices with crumbled Italian turkey sausage meat which makes the soup easier to eat and just a little lower in fat. I also replaced the cream with fat free half and half, and added sliced baby carrots in my version as well. The potatoes and sliced kale which are signature ingredients are still included and I think that although my version may be different that the one found on the restaurant menu, it is equally delicious and best of all lower in fat. I believe the restaurant version may also have bacon in it, but it really isn’t needed as the soup has lots of flavor without it. 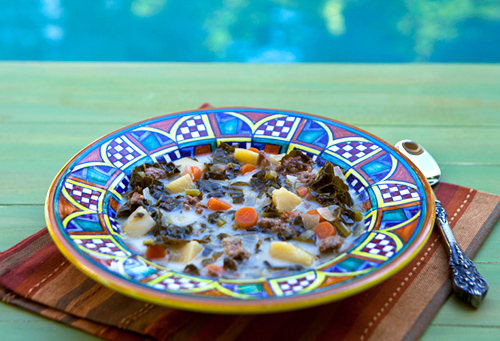 You can prepare this soup in a stock pot on the stove, or even in a slow cooker if you prefer. I’ve made it both ways and both methods work just fine. When I used my slow cooker, I simply browned the turkey sausage first in a frying pan on the stove, then added it to the rest of the ingredients in the slow cooker. My husband prefers this soup without the added cream (or half & half), so I leave it out for him. Along with it’s other members of the Brassica family, kale provides an excellent source of vitamins A, C, Carotenoids, along with a decent amount of fiber, iron, and calcium. The amount of vitamin K, important for blood clotting, in kale is far superior to that found in broccoli, spinach, and Swiss chard. Fat free half & half replaces heavy cream in this recipe reducing calories from fat. Turkey sausage is much leaner than pork sausage and adds great flavor with much fewer calories. 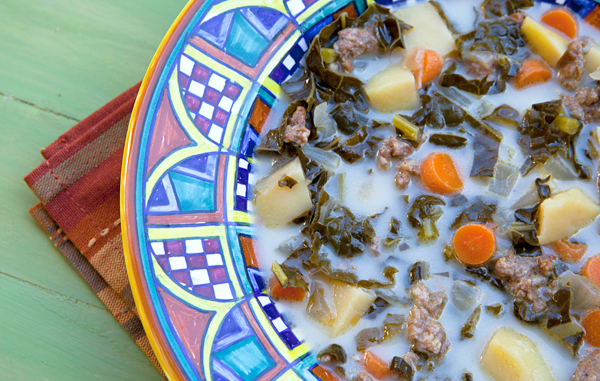 A much healthier version of this popular restaurant soup. Heat the oil in a large frying pan, add the sausage meat, and cook over medium heat until browned. Add the onions in the same pan until translucent, then add the garlic, and cook another minute or two. In a large soup or stockpot, add the chicken broth, kale carrots, and potatoes. Bring to a boil, and then reduce the heat to medium low and cook 10 minus. Add the sausage and onion mixture with the half and half cream, cook for 20 minutes more. Season with salt and pepper and serve, offering a sprinkle of grated Parmesan cheese if desired.